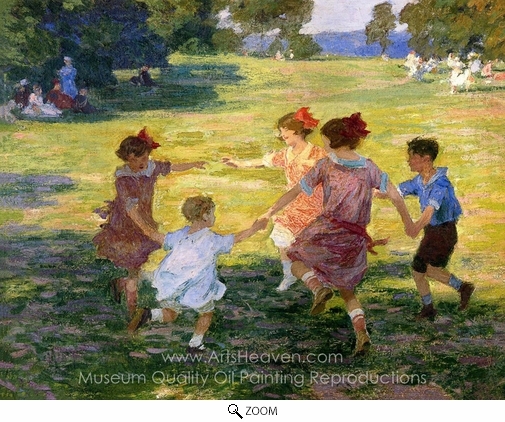 Edward Henry Potthast's Ring Around the Rosie is a joyous slice of life from New York City in the early years of the twentieth century painted by a man who came to dominate the genre of American Impressionism with his scenes of people at leisure and at play. Having journeyed to Paris in 1886, Potthast saw first hand the remarkable studies of light and the effects of the changing impressions of sun and shade of the French Impressionist movement that by that time had began to challenge the authority of the French Academy. Having previously studied under Thomas Satterwhite Noble in America and Carl von Marr in Munich, Potthast's craft was a melange of continental elegance and yankee optimism. Like many other painters of his day Potthast worked as an illustrator for a number of popular weekly magazines. Before the age of cinema, radio, or television, popular magazines were the best way of disseminating new trends and styles, and top illustrators were highly lauded as great commercial artists. This gave Potthast the opportunity to develop his talent for creating finely-tuned images that reflected the aspirations and pleasures of his target audiences, displaying the lives and carefree joys of a day in Central Park, the landscape of New England and the beaches of Long Island. While illustrating for Scribner's and Century Magazine, Potthast held firm to his initial dream of making it as an artist rather than as a commercial illustrator, managing to secure a prestigious commission decorating the inside of the Chicago National Bank and gaining membership at the Society of American Artists and the National Academy of Design. By the beginning of the twentieth century, Potthast's talents were finally beginning to meet with artistic acclaim. Around the time Potthast painted Ring Around the Rosie he had been invited by the Santa Fe Railroad, along with four other leading artists, on an expedition to paint the Grand Canyon. 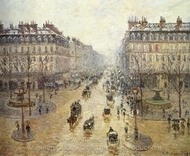 By 1910 he had also began to turn his hand to reproducing the techniques of the Impressionist school he had seen on his visit to Paris some two decades before. His holiday scenes, characterised by an idiosyncratic study of the effects of light, became his trademark, turning himself into a lighthearted painter of rest and relaxation. His Ring Around the Rosie is a timeless image of children at play, a relentlessly positive image wherein no hint of cynicism is allowed to penetrate. 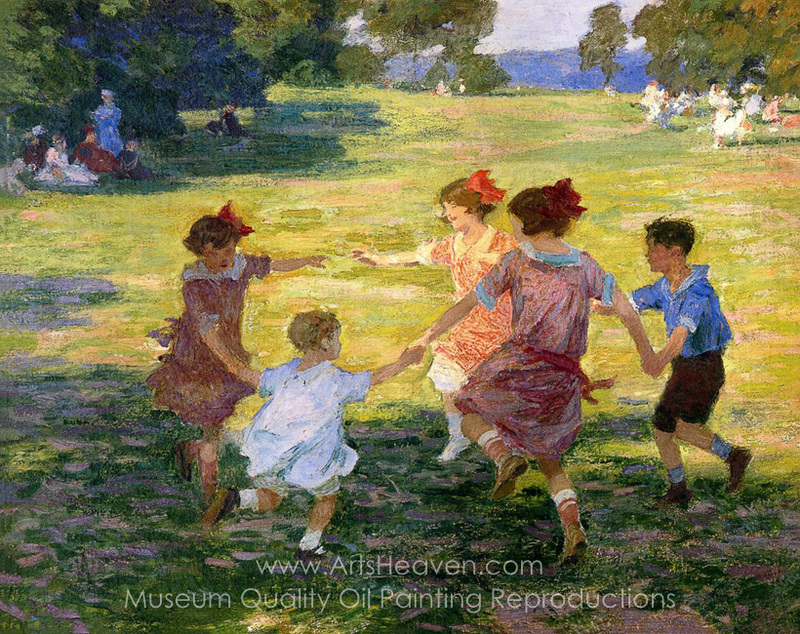 Decorate your home or office with our beautiful museum quality art reproduction of Edward Henry Potthast Ring Around the Rosie painting. Why settle for a print, poster, giclee or canvas transfer when you can grace your walls with a genuine oil on canvas painting reproductions for sale at up to 75% below gallery prices. You are commissioning an authentic hand-painted oil painting on quality artists canvas. Painted by professional artists brushstroke-by-brushstroke with attention to all details. Order your Masterpiece today and get Free Shipping to your door direct from our studio.